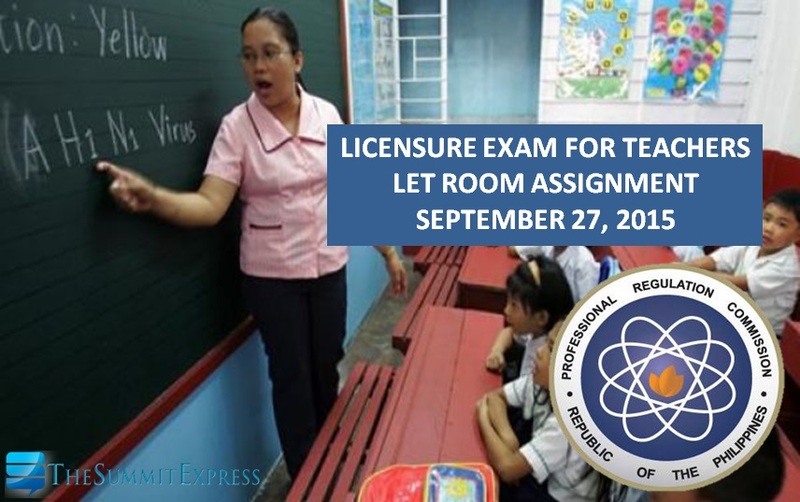 Those awaiting room assignment in Metro Manila (NCR) for the September 27, 2015 Licensure Exam for Teachers (LET) or Teachers board exam can find here the complete list for Elementary and Secondary levels. The Professional Regulation Commission (PRC) has released the room assignment on Tuesday, September 22 or 5 days before the examinations. Aside from Manila, PRC will administer LET exams in the following testing centers: Baguio, Cagayan de Oro, Cebu, Davao, Iloilo, Palawan, Laoag, Legazpi, Lucena, Pagadian, Rosales, Tacloban, Zamboanga, Bacolod, Tuguegarao, Masbate City, Catarman, Jolo, Sulu, Palawan, Oriental Mindoro, and Hong Kong. Like Us on Facebook or follow-us on Twitter to receive updates and results of September 2015 Teacher's board exam. We also deliver news via RSS Feeds or E-Mail.